A developer’s plans to build up to 520 homes to the south of Melton will be determined by a planning inspector at a forthcoming public inquiry. Earlier this year Cheshire-based Gladman Developments Ltd submitted an outline planning application to Melton Council to build the homes on three fields off the A607 Leicester Road, north of Kirby Lane. 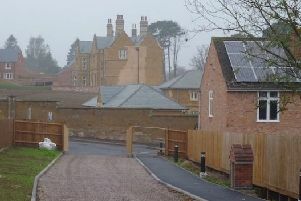 A design and access statement accompanying its application said the scheme would provide a mix of two to five bedroom homes, ranging from first-time homes to larger family homes. A green public open space (4.91 hectares) would also be provided to the north of the site, a children’s play area in the north east of the site and a 2,000 sqft convenience store near to the Leicester Road entrance to the site. A transport assessment report, commissioned by Gladman, stated: “The National Planning Policy Framework (NPPF) states that development should only be prevented or refused on transport grounds where the residual cumulative impacts on development are severe. The traffic impact assessment shows the proposed development would have a minimal impact on the highway network and should not be considered as severe. Gladman have made their appeal following Melton Council’s failure to determine its application within the statutory period. A date hasn’t yet been set for the inquiry which will be held in due course.